Today, the U.S. Department of the Treasury received repayments on its Troubled Asset Relief Program (TARP) investments in Wells Fargo and Citigroup in the sum of $45 billion, bringing the total amount of repaid TARP funds to $164 billion. Wells Fargo repaid $25 billion under the Capital Purchase Program (CPP) and Citigroup repaid $20 billion under the Targeted Investment Program (TIP), both of which will wind down at the end of this year. Treasury now estimates that total bank repayments should exceed $175 billion by the end of 2010, cutting total taxpayer exposure to the banks by three-quarters. In addition, effective today, Treasury, the Federal Reserve, the Federal Deposit Insurance Corporation and Citigroup terminated the agreement under which the U.S. government agreed to share losses on a pool of originally $300 billion of Citigroup assets. This arrangement was entered into in January of this year under Treasury’s Asset Guarantee Program (AGP) and was originally expected to last for 10 years. The U.S. government parties did not pay any losses under the agreement and will keep $5.2 billion of $7 billion in trust preferred securities as well as warrants for common shares that were issued by Citigroup as consideration for such guarantee. With this termination, the AGP is being terminated at a profit to the taxpayer. Treasury currently estimates that TARP programs aimed at stabilizing the banking system will earn a profit thanks to dividends, interest, early repayments, and the sale of warrants. Total bank investments of $245 billion in FY2009 that were initially projected to cost $76 billion are now projected to bring a profit. Taxpayers have already received over $16 billion in profits from all TARP programs and that profit could be considerably higher as Treasury sells additional warrants in the weeks ahead. In order to pay for coverage expansions (and other spending increases), the Senate health bill includes a mix of tax increases and spending reductions. Notable among these are several provisions that would reduce future Medicare spending and increase Medicare revenues. Some opponents of the bill have argued that the spending reductions would eventually drive providers from the program and thus hurt Medicare beneficiaries. In response, some proponents of the bill have made an interesting argument: that the spending reductions and revenue increases would actually strengthen Medicare by extending the life of its Hospital Insurance (HI) trust fund, which pays for Part A of the program. That argument is interesting for two reasons. First, it is absolutely correct within the narrow confines of trust fund accounting. The Medicare spending reductions and revenue increases in the Patient Protection and Affordable Care Act (PPACA) would indeed extend the life of the HI trust fund, thereby allowing Part A payments to continue further into the future. Second, that logic implies that many of the budget savings from the Senate health bill will eventually be used to pay for further Medicare benefits. As a result, those savings won’t be available to pay for the coverage expansions and other spending increases in the bill. In short, if you believe that the bill will strengthen Medicare, you shouldn’t believe that the Part A spending reductions and revenue increases are helping to pay for health reform. The key point is that the savings to the HI trust fund under the PPACA would be received by the government only once, so they cannot be set aside to pay for future Medicare spending and, at the same time, pay for current spending on other parts of the legislation or on other programs. In practice, the improved part A financing [resulting from the Senate health bill] cannot be simultaneously used to finance other Federal outlays (such as the coverage expansions under the PPACA) and to extend the trust fund, despite the appearance of this result from the respective accounting conventions. Bottom line: Don’t double count the Medicare spending reductions and revenue increases in the Senate health bill. Q3 keeps looking weaker. The original estimate of Q3 GDP growth came in at a healthy 3.5% annual pace. The second estimate was a respectable 2.8%. And this morning, the Bureau of Economic Analysis released its third estimate: an underwhelming 2.2%. 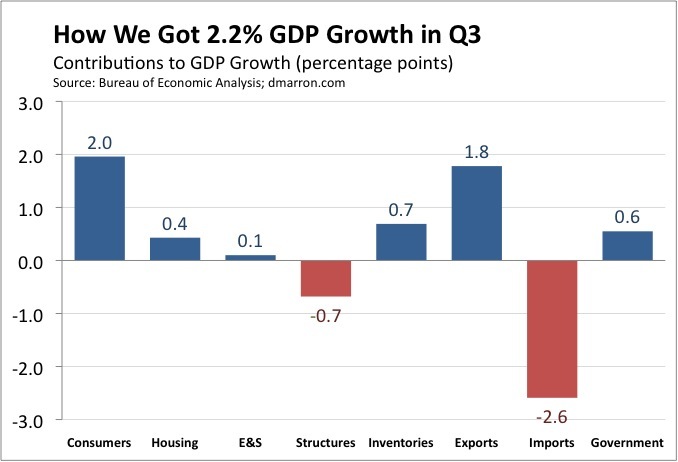 Growth of 2.2% is, of course, much better than the sharp declines in the previous four quarters. But it is still a disappointment. If you compare these figures to those in the BEA’s second estimate, you will see that the latest revision was spread across several categories. Consumers, housing, equipment and software, structures, and inventories were all revised slightly downward. In principle, the solid growth in consumer spending and housing investment in Q3 should be promising signs, given their previous weakness. However, both were boosted by temporary stimulus efforts. Cash-for-clunkers lifted consumer auto sales in Q3, for example, but we should expect some payback in Q4. Meanwhile, the tax credit for new home buyers helped housing investment record its first increase since late 2005, but some of that may have come at the expense of future housing investment (because potential home owners accelerated purchases when they thought the credit was going to expire; it’s since been extended and broadened). Note: If the idea of contributions to GDP growth is new to you, here’s a quick primer on how to understand these figures. Consumer spending makes up about 70% of the economy. Consumer spending rose at a 2.9% pace in the third quarter. Putting those figures together, we say that consumer spending contributed about 2.0 percentage points (70% x 2.8%, allowing for some rounding) to third quarter growth. According to this morning’s Wall Street Journal, the 2000s are on track for a dismal record: the worst performance of U.S. stocks in any decade on record. According to data from the Yale International Center for Finance, stocks have fallen about 0.5% per year, on average, during the current decade. Unless stocks stage a healthy rally in the next two weeks, the 00s will thus come in behind each of the past 17 decades, including the -0.2% average annual return of the 1930s. As the article notes, this comparison is partly driven by a “quirk of the calendar, based on when the 10-year period starts and finishes.” For example, stocks fell more in the ten-year period ending in 1938 than they did in the 00s. For a nice year-by-year display, see the WSJ’s graphics (which include the chart to the right). Let’s hope the 2010s do better. UPDATE: The Congressional Budget Office discovered an error in its original cost estimate for the revised Senate health bill. CBO originally projected that the Independent Payment Advisory Board (IPAB) created by the bill would lead to substantial reductions in Medicare spending beyond 2019. CBO’s revised estimate shows significantly smaller IPAB savings in future decades. CBO’s new letter does not specifically address the federal commitment to health care (the specific cost measure discussed in this blog post), but it appears that the potential reductions are much smaller than originally reported. Buried deep in CBO’s cost estimate of the new Senate health bill is a striking conclusion: CBO believes that the health bill would eventually reduce the federal commitment to health care. In short, the bill would eventually bend (or, at least, lower) the federal health cost curve (including both spending and tax subsidies). That conclusion comes with two crucial caveats: CBO’s estimates into future decades are subject to great uncertainty and assume that the legislation executes exactly as written. As CBO itself points out, that latter assumption is shaky — Congress will undoubtedly revisit health care repeatedly in coming years and may well decide to soften the spending reductions and tax increases specified in the bill. Still it is striking that the bill, as written, might reduce the federal commitment to health beyond the first decade. That certainly distinguishes it from the previous version of the Senate bill. In subsequent years [i.e., after 2019], the effects of the proposal that would tend to decrease the federal budgetary commitment to health care would grow faster than those that would increase it. As a result, CBO expects that the proposal would generate a reduction in the federal budgetary commitment to health care during the decade following the 10-year budget window. By comparison, CBO expected that the legislation as originally proposed would have no significant effect on that commitment during the 2020-2029 period; most of the difference in CBO’s assessment arises because the manager’s amendment would lower the threshold for Medicare spending growth that would trigger recommendations for spending reductions by the Independent Payment Advisory Board. The range of uncertainty surrounding these assessments is quite wide. The change in the IPAB is a bit arcane, but potentially a big deal if future Presidents and Congresses let it do its thing. Under the original Senate bill, the IPAB recommendations would be relevant only to the extent that Medicare spending per beneficiary was projected to grow faster than overall per capita health spending. In the new bill, the threshold is set much lower, reflecting inflation in overall consumer prices and consumer medical inflation. That change gives the IPAB more teeth and, in later years, more bite. Majority Leader Harry Reid released his revised health care bill today; the Congressional Budget Office followed shortly thereafter with its cost estimate. • The tax credit for small businesses would be made available to firms paying somewhat higher average wages, and it would first take effect in 2010 rather than 2011. • The penalty for not having insurance would be the greater of a flat dollar amount per person or a percentage of the individual’s income, which would increase the amount of penalties collected. • The provision establishing a public plan that would be run by HHS was replaced with a provision for multi-state plans that would be offered under contract with OPM. • Several provisions regulating insurers were added, including a requirement for an insurer to provide rebates if its share of premiums going to administrative costs exceeds specified levels and a general prohibition on imposing annual limits on the amount of benefits that would be covered. • Additional federal funding for CHIP would be provided to states in 2014 and 2015. • The increment to the Hospital Insurance portion of the payroll tax rate for individuals with income above $200,000 and for families with income above $250,000 was raised from 0.5 percent to 0.9 percent. • The 5 percent excise tax on cosmetic surgery was eliminated, and a 10 percent excise tax on indoor tanning services was added. • Community health centers and the National Health Service Corps would receive an additional $10 billion in mandatory funding. • Revisions to and extensions of the Indian Health Care Improvement Act were added. The Business News Network of Canada interviewed me yesterday about TARP and Fed Chairman Bernanke’s “Person of the Year” award from Time Magazine. Within current budget rules, the Congress can indeed use unspent TARP money to “pay for” new spending initiatives. However, it needs to cut TARP authority by $2 for every $1 it wants to spend. Those “savings” are mythical, however. Treasury Secretary Geithner recently predicted that TARP would use at most $550 billion of its $699 billion in authority. Trimming TARP’s authority by a moderate amount (e.g., $50 billion) will thus generate no actual budget savings. Only deep cuts would begin to generate some savings. The financial system is not fully healed, and the United States still lacks a coherent system for dealing with large, failing financial institutions. For that reason, I support Geithner’s extension of TARP as an insurance policy. However, I do not support the TARP extension if its main effect it to allow Congress to use TARP “cuts” to generate mythical budget “savings” or to encourage creative uses of TARP money. Usain Bolt had a remarkable year, but Chairman Bernanke is still the right choice as Person of the Year. And he’s the right choice for Fed Chairman. But his work is only half done. If he can figure out an exit strategy that keeps the economy growing, avoids new asset bubbles, and sidesteps inflation, then maybe he will be Person of the Year again next year.